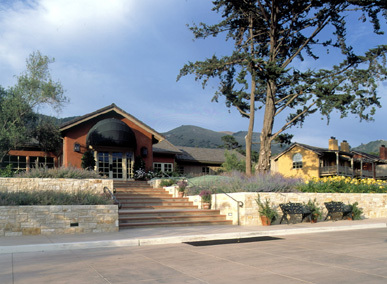 I'm off relaxing at my favorite local getaway, Bernardus Lodge in Carmel Valley. Every time I come here--and it's approaching 10 visits in the last four years--I am awed and inspired by the landscape architecture. Designed by Jack Chandler, it is as timeless as it is tasteful... even as the plantings have been evolved over the years, it still retains a classic beauty. This is a testament to what a well-thought-out landscape should be: not so much a statement of ego as an evocation of place. As enamored as I am with the planting plan, perhaps my favorite piece of architecture here is the fireplace sited at the center of the social areas. Even when it's not in action, it's a gorgeous anchor; and at night, it is rarely enjoyed by fewer than half a dozen people. By some standards, the resort's design is conservative; but by mine, it's a perfect blending of ancient and contemporary--and most importantly, it is well liked and well used. Come down some time, and be inspired yourself! How beautiful John. Thank you for sharing. I've only ever seen photos of it on Chandler's website. Lucky you to spend a few days recharging in such an environment! Susan, do you believe we make our own luck? Even though the weather today is 60F and cloudy, it's an amazing and inspiring place.